With just a few clean clothes left in our suitcases, the last evening in Rome brought yet another unplanned surprise. We were invited to a dinner with Cardinal Sanchez (I didn’t know we had 3 Filipino cardinals, as there are only 2 in the Philippines!) who has been at the Vatican for decades. It was a small private dinner in a stunning private home so I wonâ€™t say much lest I offend our brilliant and utterly private hosts. The food was terrific and the conversation sufficiently peppered with interesting views on religion and politics (the two typically off-limits topics of polite dinners). But I must say a big thank you to our hosts that evening and hopefully they will read this postâ€¦ We had a wonderful dessert at that dinner but we had one more food experience we just had to have before we left Romeâ€¦Il Gelato San Crispino. Just a few meters from our apartment and open late into the evening, was a suburban outpost of the well regarded and written about Gelateria. We entered and armed with a mission to put the place through its paces, ended up ordering 10 different flavors of gelato in one visit!!! First I have to commend them for the best fruit sorbets I have tasted, period. Not only were they light and not overly sweet, they were made with incredibly fresh and premium fruit and the flavors were unlike any commercial gelato/sorbet I have ever had. The place prides itself in the use of no artificial flavors or colors whatsoever and the set-up of the shop is more akin to a doctorâ€™s clinic than a gelato joint. We tried the apple, grapefruit and pear sorbets and they were to die for. Apparently, the only way to make really good sorbet is to use fresh and not stewed fruit. That way, the fruit flavor, if it is done right, really comes across as the ice melts on your tongue. The Kid and Mrs. Marketman got in on the act and we rapidly polished off servings of ginger cinnamon, meringue with cacao bits, honey, cocoa, vanilla, pistachio, strachiatella (spelling?) and one other flavor I canâ€™t even recall the name of! Overall verdict? The best gelato we had had on the entire trip, definitely! Because the scoops were rather small and we were splitting orders, the whole mad gelato tasting caper cost less than Euro 20, a brilliant bargain if you ask me. I thought about madly begging for a franchise for Manila until I realized I couldnâ€™t get freshly picked Hazelnuts from Northern Italy, pears that had just reached their peak in ripeness 12 hours before or honey from hives near fields of wildflowersâ€¦ Now if only I knew the methods, I could have mango, mangosteen and palawan cherry sorbets and gelatos flavored with Bohol cacao, pili nut pralines, yemas, etcâ€¦ Some things you just have to dream about! I can only dream of what they must’ve tasted like, MM! over here the only gelato i’ve tried is Amici di Don Bosco’s, made by the Don Bosco fathers. It’s a milk-based one that my 6-year old nephew and I used to savor. They have quite a range of flavors depending on what’s in season. Now, alas, I don’t get to go there as much without the prodding of said nephew. But now that you’ve written about gelato the urge is there to go and indulge! Marketman, you could go to Gelato School in New Jersey, learn how to extract and intensify flavours and make your very own gelato. Now is Manila ready for P200. a scoop gelato? OhmyGod! Thank you for the pictures, you just brought me back. This is the ultimate gelato. Had to taste the others in Rome, even just a small cone (Giolitti, etc.) 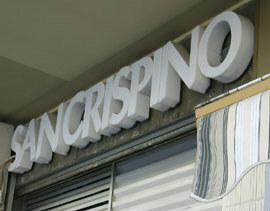 but nothing was like San Crispino! Time for another trip soon, your post just sealed it! I served it with crusty garlic baguette slices and with generous sprinkling of parmesan cheese and EVOO. It was superb! Kamsahamnida for the wonderful recipe! Hi MM! Would ” Sister” know exactly the name of the Gelato School in New Jersey? Is there anyway I can get in touch or perhaps a website that I can get into. Someone is really seriously interested in learning more about gelato making. Would really appreciate it. Thanks a lot! It’s “stracciatella” ( a “c” followed by an “h” is pronounced as a hard “k” sound). Will wait for any infomation from Sis. Thanks MM. They are a bit flaky to deal with and you have to call for prices. Hi Sister ( I hope its ok to call you Sister). Thanks for your valued info. Will be going to New Jersey in Sept. I hope I can look them up. Thanks again. Market Man, San Crispino is considered the best gelateria in Rome. During a trip in 2004, our tour guide highly recommended it and it did not let us down. ANG SARAP!!! If you all think San Crispino has the best gelato, you should all head up to Milan to RivaReno Gelato in 8 Viale Col di Lana. http://www.rivareno.com We traveled all over Italy from north to south and tasted just about any gelato in sight. RivaReno gelato wins hands down! It’s gelato is the creamiest, tastiest and most velvety we have ever tasted! Once you taste RivaReno gelato you simply don’t want any other kind anymore. It obviously uses the best and freshest ingredients. We keep talking about it long afterwards and wishing we had them in the US. We think anybody who loves gelato should go there to try their heavenly creations! i tried to check out paris gourmet but there was no site. Hi Marketman! Just recently came across your blog and must congratulate you. I think it is one of the best I’ve read. Your post on shittybank reminded me to request for a lower credit limit es since my kids have supplementary cards as well. Sometimes I forget to check if my own cards are safely in my wallet. Re San Crispino, just had to “second the motion”. It’s really the best! On our last trip there in October last year, the servers were both Pinoys who generously topped up our servings. Thanks for your posts! Love them esp anything about food! We offer gelato training classes in Baltimore and Las Vegas – just as a reference for those who find this blog regarding gelato classes.